IMLS has released a new data visualization tool to help libraries use Public Library Survey data. Edge: In 2015, 73% of NC libraries participated in the Edge Assessment, evaluating public technology services. The results outlined in this report showed us where NC libraries stand in three categories: Community Value, Community, Engagement, and Organizational Management. Download NC's 2015 report. Download NC's 2014 report. 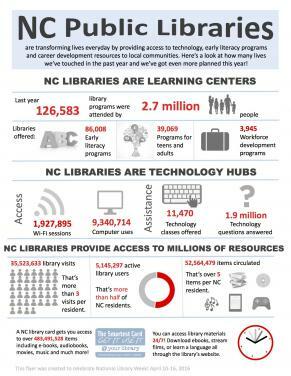 Impact Survey: In 2014, 45% of NC libraries participated in the Impact Survey, which gathered 5,381 responses from patrons across the state about how and why they use library public access technology (education, employment, health info, etc.) Download State Library's summary of findings. Download the Impact team's full report. NC Highlights: Beginning in FY2010, the Institute of Museum and Library Services (IMLS) provides a one-page report for each indiviudal state based on the national Public Library Survey dataset. Download NC's FY2012 report. Download NC's FY2011 report. Download NC's FY2010 report. IMLS Annual Public Library Survey Reports: Every year, statisticians at the Institute of Museum and Library Services analyze the data from the annual Public Library Survey and write an in-depth report about national trends in public libraries. Over 20 years of these reports are available as PDF downloads. Reports are finalized and released 1.5 years after the survey ends, so federal data for the most recent fiscal year is not available. See the reports here. Digital Inclusion Survey: The Digital Inclusion Survey was developed by IMLS, the University of Washington, and the International City/County Management Association to highlight the public library’s role as a community anchor that ensures public access to technology, digital content, and Internet-enabled services. The survey focuses on Access, adoption and application of technology in public libraries. See the reports here. Project Outcome is a tool developed by the Public Library Association to help libraries show the impact of their services and programs on their communities by providing easy to use survey templates and analysis tools. Template surveys allow libraries to gather outcome-based data in the following areas: civic engagement, digital inclusion, early childhood literacy, economic development, education and lifelong learning, job skills, and summer reading. The Edge Initiative is a toolkit to help libraries assess their public access technology infrastructure and services against nationally recognized benchmarks. The toolkit includes an assessment, recommendations and planning tools, resources to help implement changes, training and communication tools. The State Library of NC currently offers the Edge Toolkit to all NC public libraries. Public Library Data Service Statistical Report is conducted by the Public Library Association and includes US and Canadian libraries. The PLDS collects information from public libraries including finance, collections, services, and annual use figures. The survey also has an annual "hot topics" section which as included youth services, public library facilities and young adult services. All NC public library data collected as part of the Public Library survey is migrated into the PLDS tool to all easier participation from NC libraries. Libraries that wish to participate still need to login to the PLDS to answer additional questions and submit data to be included. Participants receive a free copy of the annual report and raw data files can be purchsed. The Public Library Survey is a federal data collection administered locally by state library agencies and reported to the Institute of Museum and Library Services. The survey asks libraries to report on finances, staffing, collections, programs, technology and use. Participation in the survey is a requirement of State Aid regulations for NC public libaries. NC survey data is available on the SLNC website. This IMLS-funded learning module was created to help libraries implement outcome-based measurement and use the logic model to evaluation services. Find general information on survey creation and administration as well as template surveys. From the State Library of New York, this online tutorial guides you through the steps of planning and conducting a community survey. A virtual resource center for applied social research and evaluation by Bill Trochim of Cornell University. Publications produced by the University of Wisconsin Extension office that are meant as resources for evaluation of programs. This tool developed by IMLS allows libraries to search for comparable libraries and explore Public Library Survey data. This Excel tool was created by the State Library of Connecticut. Select a library from a dropdown menu and see 40+ charts comparing annual survey data from your library to libraries of similar size in your state and the nation. This interactive map and data tool allows users to search and see funding sources at the national, state and local levels and answer key questions about regional funding trends. Data visualizations such as maps, network connections and partnership pathways will highlight key networks of funders and recipients as well as individual grants. LibPAS is a web-based service that provides advanced reporting for library performance metrics and data. Login required: access for library staff only. Contact amanda.johnson@ncdcr.gov if you would like access. The Digital Inclusion project makes available an amazing interactive map that overlays demographic, health, economic, and education data with public library survey data. Select a branch library to see data about the community it serves, or draw custom map areas to get data about a particular neighborhood. Library Mad Libs! Gather feedback by asking patrons the story of their visit.